For the first time in the three races there were actually pictures of me- yay! And not only one or two- a good selection. While clicking through them I was initially pleasantly surprised with how I looked- comfortable, enjoying myself, good outfit (ha) but the more I analyzed them the more discouraged I got. I couldn’t help but notice some serious problems with my running form. Heel strike like WOAH. Granted, this is right as I was coming up to the finish line and the pictures aren’t quite as bad (still pretty bad though, let’s be honest) earlier on but this is extreme. 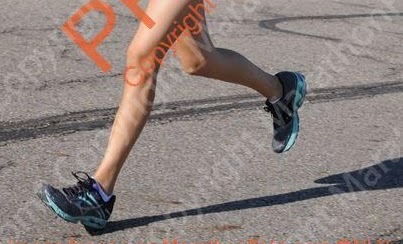 My stride is also pretty huge, but I am going to attribute that to the fact that I was “sprinting” at this point. I am still running on the outside of my foot. Almost every picture really showed that. No wonder I’ve been dealing with foot problems after my longer runs! This is not good and I don’t even know where to begin to fix it. I’ve been trying to be a bit more conscious of this while I run but I notice that as I start to adjust it I start heel striking even more. During my 16 miler (which yes, I did finish. Yay PDR!) I had a lot of time on my feet to try out new things. When I really put my mind to it I could hit a good midfoot strike with no side-foot action but it took a LOT of concentration (therefore it was not very maintainable). I don’t think that 7 weeks out from my first marathon is a great time to try to drastically change my form but I do know that if I keep running like this I’m just asking for an injury. I have grand plans of starting essentially from scratch post-race- low, slow mileage with proper form and building from there. As for the side-foot, my shoes are coming up on the end of their life so my plan is to take some of the screen shots from the race with me to see if maybe a new shoe will help.